One of the most challenging MITA games is the Analogy game, in which a child must notice the relationship between the objects in the top row and then apply the same logic to the objects in the bottom row. Because this game requires not only attention but also logic, it is only recommended for older kids, or for ones who have shown steady progress with the other MITA games. 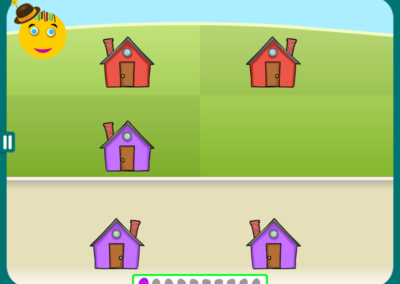 For example, in the puzzle below, a child must notice that the two red houses in the top row are mirror images, and complete the analogy by finding the mirror image of the purple house from the two choices at the bottom. As in previous games, the difficulty is increased by adding distractors that are similar to the correct answer. In the puzzle on the left, two houses become one; in the puzzle on the right, the color of the house changes. A child must figure out the logic, and discard the distractors to find the correct answer. Later levels further increase the difficulty by making more complex and nuanced changes in the top row. For example, in level 40, not only does the shape of the house change, but a friendly house inhabitant is added to the image. A child must notice both features and make the same change to the tall yellow house without getting tripped up by any of the distractors. 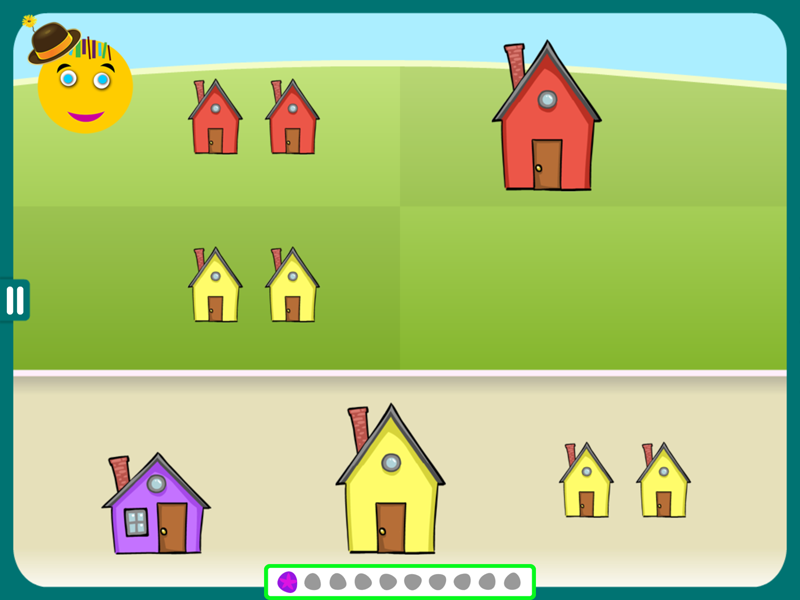 Just in case that was too easy, in the final level of this game, a child must notice the color, shape and orientation of all the houses, as well as attend to fine details.